MOOG Protokraft designs and manufactures electronic and electro-optic components and subsystems for use in harsh environment networking equipment applications. 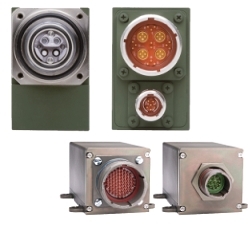 Their Video format and Ethernet fiber optic media converters are designed for use in harsh environments where small size and weight reduction are valued. Eagle series GigE Vision® video format converters that grab images from 2xRS-170 or 1xBase Mode CameraLink® sources and convert them to the GigE Vision® protocol for efficient video transport and distribution over Ethernet networks. Falcon series dual DVI fiber optic media converters is a D38999 / 19-18 Quadrax connector enabling interconnection to a standard DVI connector interface with a Quadrax cable adaptor. Maverick series fiber optic Ethernet media converters consist of optoelectronic transmitter and receiver functions integrated along with the 10/100Base-TX to 100Base-FX or 1000Base-T Ethernet electrical to 1000Base-LX or 1000Base-SX Ethernet optical media conversion circuitry into an environmentally sealed unit. Excalibur series optical fiber transponders consist of optoelectronic transmitter and receiver functions integrated into a bulkhead mounted MIL-DTL-38999, series III receptacle connector along with the 10 Gbps / XAUI SerDes functions. Stingray series Ethernet fiber optic media converters consist of optoelectronic transmitter and receiver functions integrated along with the 10/100Base-TX to 100Base-FX or 1000Base-T Ethernet electrical to 1000Base-LX or 1000Base-SX Ethernet optical media conversion circuitry into an environmentally sealed unit with a Jam Nut M83526 / 21-02 expanded beam optical connector interface.